Cape Town - Rookie Highveld Lions wicket-keeper and left-handed strokeplayer Quinton de Kock is set to earn the full, three-match one-day international series against New Zealand as the designated Proteas gloveman. The 20-year-old former SA under-19 star, who will be making his maiden ODI appearances after being blooded in the similarly three-game Twenty20 series against the Black Caps, has also started receiving some mentorship from retired, long-serving international Mark Boucher. Coach Gary Kirsten told Sport24 at a press briefing in Constantia here on Thursday that captain AB de Villiers, who has been in sparkling all-round form at Test level of late, will be relieved of the ‘keeping responsibility against the New Zealanders - starting at Paarl on Saturday - in order to focus on leadership and his pretty customary No 4 batting role in ODIs. It is entirely consistent with the view expressed by Kirsten in an in-depth interview with this website even before the South African side left for their triumphant Test tour of Australia much earlier in the season. De Villiers has had occasional back problems in the past and, with his ever-increasing relish to bed down in the dual role of “top five” batsman and gloveman in Tests, Kirsten feels that there may be advantages to him being relieved sometimes of duty behind the stumps in the one-day arena. “The plan is to ‘keep with Quinton in all three (fixtures),” Kirsten said. “The reason behind that is twofold: we want to give AB the real chance of just being the captain. He feels that to lead, bat at four and ‘keep in ODIs is a hard task, especially as a new captain - it’s something we spoke about even before he (took the ODI reins from Graeme Smith). “I was also concerned it might be too much of an ask of him. Asked whether De Kock might be affected by the disciplinary cloud hanging over him, following a Sunfoil Series series incident in which he allegedly barged Cape Cobras player Alistair Gray recently, Kirsten replied: “Well, I’ve met him once before and the longest conversation I have had has probably been one minute! “I’m not concerned about it, given that what the Proteas brand stands for, certainly at Test level and also filtered to the other formats: what underpins our performances is our team culture. “He’ll get a very good understanding of that in the next few days, and I think that will certainly help him and give him direction in terms of how to go about his cricket in the future. 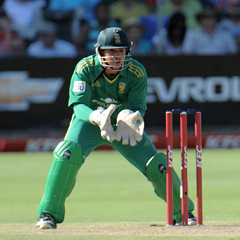 Kirsten stressed that the move to relieve De Villiers of the glovework in this format against the Black Caps was not cast in stone. “These things are pretty flexible ... I don’t want to make a statement now that ‘this is how it is’. Things do change, as they did in the Test side (in terms of the ‘keeping). “Now he is ‘keeping as well as I have seen anyone ‘keep in Test cricket, and suddenly we can add massive strength by adding a batter at seven. As for Boucher’s involvement, Kirsten explained: “We’re just feeling it out at the moment, to be honest. When Bouch retired ... with all his experience, he has a lot to offer so we just felt a perfect place for young Quinton would be to spend some time with him.